Sporting the new logo of the Toronto Maple Leafs on his chest, Auston Matthews made his on-ice debut as a member of the Original-Six franchise. The American centre and No. 1 overall pick of the 2016 draft was on hand with 40 other players at Leafs development camp, which started Monday in Toronto and will continue the rest of week in Niagara Falls. Matthews, wearing No. 63, was among the first players to skate at MasterCard Centre on Monday morning. He underwent on-ice testing and medicals with seminars on nutrition and sleep scheduled for later in the day. "Just learn as much as possible, soak it all in," Matthews said. Matthews can finally get back to hockey after a draft-centric few weeks (and year, really), highlighted by his selection as the first Leaf No. 1 overall pick in 31 years. Following the draft in Buffalo, the 18-year-old returned home to Arizona, where conversations about hockey were kept to a minimum. Matthews finally arrived in Toronto on Sunday evening after a week of skating in Grosse Pointe, Mich. He won't get a chance to see the city, with prospects departing for Niagara Falls on Monday afternoon. "It's been a little hectic, but it's been nice," Matthews said of his post-draft experience, rooming this week with Dmytro Timashov, a fifth-round pick from 2015. Long the projected No. 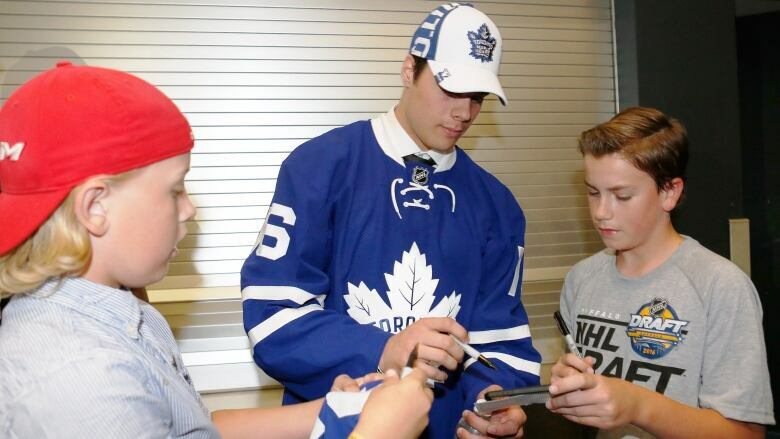 1 overall pick of the 2016 draft and an intriguing centre of attention for the NHL's worst teams last season, Matthews looked at ease in the setting of his first Leafs experience. He said he wasn't too nervous and was the picture of humility, according to new teammates. Mitch Marner, another top Toronto prospect, said Matthews didn't act like a player who just went first overall. "He's really humble about himself and with the puck he can do magical things," Marner said. Marner is one of a handful of Leafs that Matthews is at least familiar with. The two met last season when Matthews took in a Knights game. Marner starred for the eventual Memorial Cup champions. Matthews, who rung up a point per game for the top Swiss League team, also played with a few other Toronto prospects in the American development system. The development camp is yet another step in what's already been and will continue to be a hectic and memorable year for Matthews. He'll return home after the week-long camp, which includes a pair of scrimmages, and then travel back north to Toronto, not for NHL training camp, but for the World Cup where Matthews will play for Team North America. Following that will be his first NHL games with the Maple Leafs. Their season opener is slated for Oct. 12 in Ottawa.